Many people in the world have never seen a black American Express card. I was one of those people up until a few years ago. It’s interesting however that few people know what really qualifies someone to be “invited” to receive one, and entertaining to hear things like, “wow, a black card? dude that card has no limit. i know a guy that bought a Porsche with one of those.” The fact is that to receive an “invitation” to receive a black American Express card, or a Centurion card, you need to first have a platinum card, charge $250,000 in an annual calendar year and repay it on time each month. To be clear, you don’t have to spend $250k per month, but in annual calendar year, which is approximately $20k/month. You then pay an initiation fee of $5,000 to receive your card, and an additional $2,500 per year to keep your card. The black card has no material differences than a platinum card, with the exception of the actual material of the card, which is titanium. It has a limit as well, and is not like any other AMEX card in that respect. Your limit is established by spending patterns, and your credit profile. Bottom line, it’s a status symbol. It says to anyone that sees it or receives it as a form of payment that the person whose name is engraved on the bottom has more money than they have sense, or low self esteem, or both. For me it was the latter. My black card represented to others that I was important, successful, and it made me feel powerful. I would rarely flaunt the card, but certainly wouldn’t be disappointed to see the response on a server’s face when I handed her the card, or the occasional, “Hendu, breaking out the black…big timer,” from a friend who was digging on me, but in some way less secure about themselves because I had a black card and they didn’t. Silly really, but true. 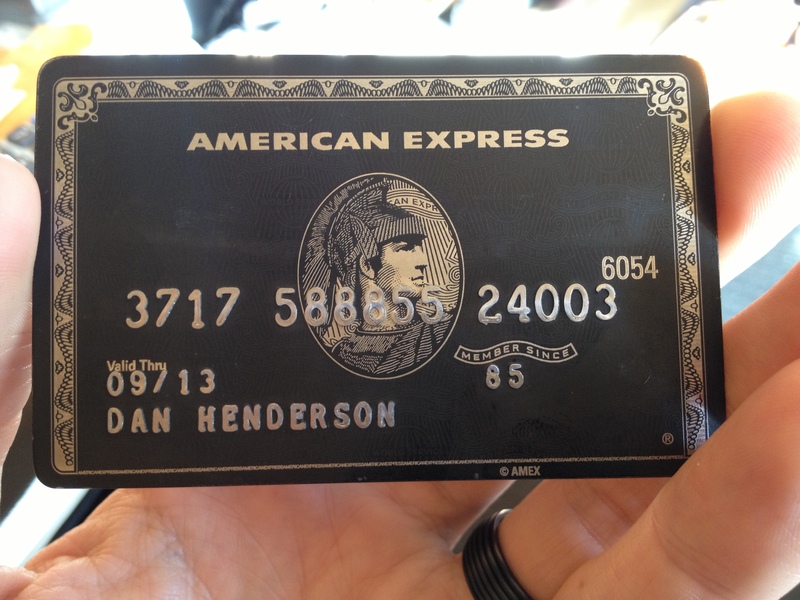 I cancelled my Centurion card many times and then had it reinstated over the past few years. I knew that the card represented my alter ego, a false identity, and a shot of self esteem on demand. It was my Golden Calf. I must admit that writing this has been something I’ve procrastinated for a long time, but it’s what I’ve needed to do even longer. No more black card for me. I plan to continue my journey of self-improvement, which includes establishing a healthy sense of self-worth. This may be a surprise to many that I struggle with self-esteem, but stay tuned to my blog, and you’ll learn a lot more about me. You may also learn something about yourself. Learning more about you all the time, man. Personally, I always thought you carried yourself well in high school. Confident, but not cocky. Great read Dan. You should blog about the right way to do business. I’ve been following you since we met on a bus at the Inc. 500/5000 Conference a couple of years ago. I had aspired to be like you, now even more so. Keep up the good self-work.